Whether you're prepping for midterms or final exams, or just trying to finish up that term paper, finding your focus can be a challenge. Most people are natural procrastinators, and the intensive workload at the end of each semester makes distractions extra tempting. While, unfortunately, there's no magic bullet for having perfect focus, there are a few things you can do to make each study session more productive. Try these tips to get the most from your studies so that you can get through exam time relatively unscathed. While the thought of tackling three tasks at a time might be attractive, that's just not how human brains work. Research shows humans work best when they focus on one thing at a time, and you should take that into account when you're studying. Instead of trying to review your notes, take a practice test and go through flashcards at the same time, try different study techniques one after the other, so you can give each one your full attention. Raise your hand if you've used the gym to procrastinate! It's ok, we've all been there. But scheduling a little bit of activity into your study sched can offer some serious benefits. Physical exercise can help tame your impulsivity, so you're less likely to ditch studying to check your phone, and it also enhances your overall cognitive functioning. The trick is to schedule in your workouts, rather than heading out for an impromptu jog. That way you get the brain-boosting benefits of exercise without using it to put off studying. If you're getting distracted during your study sessions, try giving meditation a try. Meditation naturally calms your mind, which could help you mentally filter out distractions when you go back to the books. In addition, research shows mindfulness and meditation exercises actually boost the "attention" centers in your brain – so you're primed and ready to absorb info. And if you've never meditated before? No worries. Simply get a guided meditation app for your phone so you can meditate anywhere. Studying often means being stuck inside for hours – but make some time to get a little sun. Exposure to sunlight actually impacts the levels of sleep hormones, like melatonin, in your body, and natural light enhances your alertness and mood. Take your study sesh outside for a natural boost, or pick a seat by the window if you're stuck inside. Your desk environment has an effect on your ability to focus, and if you want to make your desk more study-friendly, consider investing in a plant. Indoor plants help you feel calmer and more receptive to studying, and research shows plants actually slow mental fatigue. Low-light plants like spider plants or snake plants (also called mother in law's tongue plants) are easy to care for, so you can keep 'em alive and thriving even when you're distracted by exams. Stuck studying at home? Enhance your focus via aromatherapy. While essential oils for mental focus might sound a bit far-fetched, there's some evidence behind them. One study found that people who sniffed rosemary felt "fresher," while another found that lemon, lavender and sandalwood were linked to self-reported increases in productivity. While there's also some evidence that some benefits from aromatherapy might be related to expectations – in other words, if you expect it to work, it will – creating a calming atmosphere via scent can do nothing but help your focus. Washington State University: What Are the Benefits of Plants Indoors and Why Do We Respond Positively to Them? Tremblay,, Sylvie. 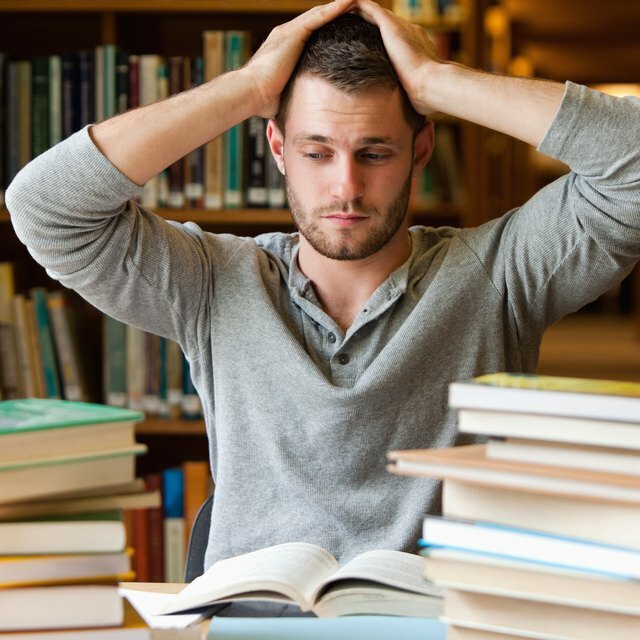 "Evidence-Backed Ways to Stay Focused When You Study." Sciencing, https://sciencing.com/evidence-backed-ways-to-stay-focused-when-you-study-13711537.html. 30 April 2018.